Ayurveda is the traditional healing modality of the Vedic culture from India. Ayushman Bhava Ayurveda is blog dedicated to the people who wants to be healthy not only physically but also mentally & socially. Matsyasana is asana performed in sitting position. It is also called as 'Fish pose'. As name suggests, it’s been said that if this asana is done in water our body floats like fish. The asana is a backbend, where the practitioner lies on his back and lifts the heart (anahata) chakra by rising up on the elbows and drawing the shoulders back. The neck is lengthened, and the crown of the head Sahasrara chakra is "pointed" toward the 'wall' behind the practitioner. -Sit in padmasana , take a deep breath and relax your muscles. -Now slowly lean back, place one elbow after the other on the floor and arch the back until the top of the head touches the floor. -Press your forearms and elbows into the floor and lift your chest to create an arch in your upper back. -Then hold the toes with the hands, otherwise bring the palms together in front of the chest. -Inhale through the nose and exhale through the mouth. Hold the position as long as comfortable. -Using the elbows for support slowly return to the starting position. As the arch of the back deepens with practice, and the heart and throat open further, the top of the head may brush the ground, but no weight should rest upon it. Initially, practice the Asana three times. After practicing this way for some time begin to extend the practice by holding the posture for a few minutes with normal breathing. - Matsyasana strengthens the upper back muscles and the back of the neck, which improves spinal flexibility and posture. 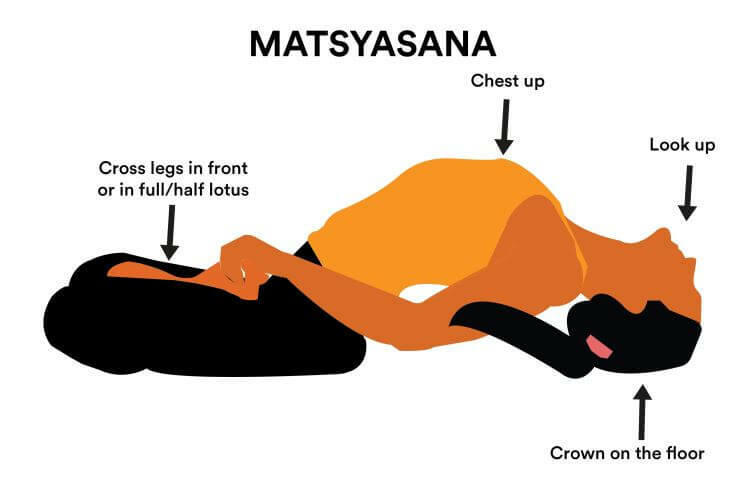 - Matsyasana opens up the lungs, which improves breathing and helps to relieve respiratory ailments. - Strengthens the respiratory system and is beneficial for asthma, bronchitis and chronic throat problems. - Stimulates kidney function and activates the thyroid gland. Stimulates and balances the Vishuddhi Chakra. - Daily practice of this asana energizes the body, and reduces fatigue and anxiety. - Practicing backbends and opening the front side of the body will help these chakras expand, which can increase self-confidence, well-being, and emotional growth. Do not attempt this asana if you are suffering from hernia or other major abdominal surgery. Also avoid this Asana if you are suffering from high blood pressure or dizziness. As mentioned above this pose is typically performed with the legs in Padmasana . If anyone has difficulty in doing padmasana then perform the pose with the legs straightened on the floor. Suffering from Headache? You should know this. Uterine Fibroids - Know Ayurvedic Remedies For It! © copyright 2019 ayushmanbhavayurveda. Powered by Blogger.